An article I wrote about two Twin Cities IWW branch events in 2011. Was originally intended for The Organizer, but was never used, so I'm posting it here. While, for good reason, our branch is focused on workplace activity, education events and having a presence within wider movements, it's important that we know when to take a break as well as support each other. Things like 'organizer hot seats', beers after General Membership Branch meetings, dance party fundraisers and more informal hanging out are some of the interactions that occur that partially provide breaks or support. Traditionally, the Twin Cities branch has organized two events every year that aim to provide this support in a more organized fashion. A camping trip in the summer and a banquet style get together in the late fall. The camping trip takes place at Mesaba Co-Op park, near Hibbing, Minnesota. 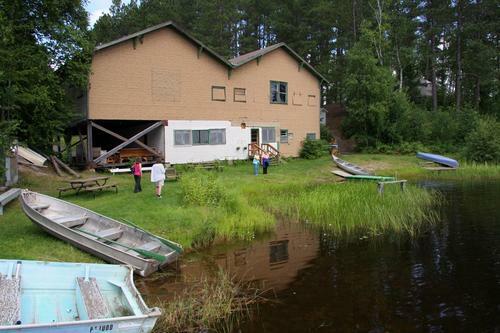 Mesaba is a cooperative campground founded by Finnish socialists back in 1929. It has a number of cabins, a small beach, a medium sized lake, plenty of places to set up a tent, a performance stage and a dining hall adorned with pictures and paintings representing Finnish-American working class radicalism. The scenery and remote location is a welcome change of pace from the busy urban centers most IWW branches are located in. This change of pace allows us to relax, rampage through the woods with our fellow workers' kids, and generally get to know each other on a more personal, rather than organizing, basis. This July, union members from the Twin Cities, Chicago, Madison, Montreal and Ottawa attended. Highlights this year include a camp wide game of 'capture of flag', early morning fishing on the lake, swimming, discussing various international revolutionary movements and hours of joke telling around a campfire. For some, this was the first time that got to meet other Wobs in the branch. For others, it was the first time meeting their comrades' family. After a weekend, we all went back to our respective cities, recharged. Our second yearly social event is called 'Red November, Black November' and took place at the CWA hall in Minneapolis. The event, named after a poem by 'Solidarity Forever' author Ralph Chaplin serves the purpose of remembering those who came before us, as well as to reflect on the year past and what we've accomplished. Whether it is 'marching on the boss' in response to firings, driving to Madison to agitate for a general strike, or initiating a campaign in a new workplace, we recognize and appreciate our fellow workers efforts. Even the less glorious, although important, efforts, such as putting events together behind the scenes, traveling around the Midwest and supporting each other in the workplace and in our personal lives does not go unnoticed. The high points of these two events: supporting each other in our organizing and personal lives, acceptance of families and children, and learning from each other's experiences are worthy lessons to apply in all of our work. Hopefully, those of us who attended this year attempt to do exactly that. An example of the program for past Red November, Black Novembers can be found here. I should add that the longest (and only) real life conversation I've had on the splits in French anarcho-syndicalism happened here between me and some Quebewobs. They seemed surprised I knew anything about it. Thank you libcom.org!